Juanita was in a murderous mood that Thursday evening. It had become a pattern at the same time every week. Thursday evenings were becoming her least favourite time of the week. She was so mad her chest was tight and her breathing hard. Someone clearly needed to be punished for what she had been put through. “You can’t be serious!” was the caustic reply. “Someone is in a happy mood tonight!” she teased. Juanita lunged at her but she grabbed her purse and dashed out, laughing all the way to the car park where her date was waiting. Still fuming and unable to relax, Juanita decided to work out her bloody emotions on her clothes. Ironing was a good way to exert herself and deal with something that won’t cry out. She hoped she would be tired and calm enough to sleep when she was done. Supper was off tonight. Who eats when they are this angry, she wondered. She brought out a pile of clothes she had washed earlier in the week and commenced the process of exhausting herself on them. There was a knock on the door to which she did not respond. The knocker let herself in anyway. It was Brenda, her classmate and neighbour from two doors away. Since Juanita’s bed was covered with clothes, she settled herself on Julie’s bed. Bad timing, Juanita thought, and continued her ironing. She was in no mood for small talk, so she ignored Brenda and her chattering. The girl was so nice she couldn’t take a hint, Juanita was thinking, till Brenda shook her shoulder. “Thank you for listening to all I’ve been saying.” Juanita who only caught Brenda’s last few words missed the sarcasm. That was awful! Juanita knew it but she wasn’t about to acknowledge it. She just wanted to be left alone and if that was what got through to Brenda, then so be it. “You’re nothing but an idiot!” Brenda spat at her as she left the room. Juanita suddenly felt drained. It was true Brenda spent an awful lot of time with her boyfriend, Timothy, but she was a good friend. She was good company – smart, funny and beautiful. And she did hang out with her most of the time when Timothy travelled. She had just hurt a dear friend because she succumbed to her Thursday rage yet again. And it’s all the fault of that Philosophy of Education lecturer! Every Thursday, they strode over one kilometre under the hot sun to attend his class scheduled from 4 to 6 p.m. He usually arrived thirty or more minutes late and kept them there till almost 7 o’clock talking all manner of stuff, including personal trivia like experiences from his time as a student plus domestic squabbles with his wife and teenage children. The most annoying thing was that he never missed a class! He would be there religiously every Thursday, spend his alloted time and more religiously but he avoided touching the course, religiously too! Any other matter would receive his detailed examination and pronouncement (including political, religious and economic sticking points nationally and internationally) except the main subject for which they were there! The majority of her classmates hailed him as broadening their general and current affairs knowledge and their enthusiasm egged him on. But Juanita felt that what was going on could pass for beer parlour discussion where lesser minds lap up what a fellow who buys the drinks pontificates. Some of the positions the esteemed doctor held on these issues, she felt, would fall apart under closer scrutiny in a rigorous intellectual discourse. But more importantly, she didn’t think she enrolled for her degree programme to be taught general knowledge and current affairs. She saw teaching as her vocation and wanted to be adequately prepared for it. Besides, she was older than most of her classmates, being on the wrong side of thirty. She was better informed than most of them having worked in the university library for years where she picked up the habit of reading quality newspapers, magazines and well-written books on diverse subjects. The death of her dad just as she was finishing secondary school had stalled her education and that of her younger siblings: two girls and a boy. She had been so thankful to get the job and with the little pay, she had helped her mum see her younger ones through primary and secondary school. She had also saved for furthering her own education. When her immediate younger sister got married three years back, she decided to seek admission into a university to pursue her dream. And there she was, having someone foul up her mood by spewing highly debatable opinions as gospel on all kinds of issues. She had wanted to skip the classes and buy some books to prepare for the exams (which were fast approaching) but, wait for it, the guy took attendance and had a knack for giving unscheduled tests! But none of these things could excuse her nastiness to Brenda, she told herself. An apology was in order even though the Brenda she knew would probably stop by on her way from Mama Gertrude’s (the nearby haunt for hungry students) to see how she was doing. She further reasoned that she needed to quickly devise a plan for going through Thursday evenings without feeling homicidal or having a splitting headache. She would buy cellular data for her phone so she could sit at the back row and surf the Internet, even if it meant visiting comedy pages on social media. She would wear an earpiece to channel the sound but would feel free to laugh. Since laughter was common in the classes, the lecturer would be none the wiser, she figured. If I’m going to spend the hours laughing, I’ll be better off sourcing my own entertainment because what is going on in those classes is not funny at all. She could also use the time to copy the notes for the Social Studies lectures she missed on Wednesdays due to a clash in the timetable. And for variety, she would have some colourful magazines handy, say fashion mags, to look at styles for her customers because she did some tailoring in her spare time to get spending money, a skill she had picked up while staying with her aunt as a teenager. There! It was all settled. Nobody was going to waste her time anymore, not even on Thursday evenings! And believing that she’d got a solid handle for preventing her weekly fury, she felt she deserved a hearty meal. So off to Mama Gertrude’s she went to treat herself and make up with Brenda. Hi! I would love to chat with you. **Is there something that really makes you mad often? What is it and how do you handle it? **What is your relationship with your lecturers or students like? Can you speak frankly to one another? **What do you think of Juanita’s ideas for enduring her Thursday evening classes? Perhaps, you can give her what you consider better suggestions. The course content probably doesn't extend to current affairs. I'm guessing the philosophy of education should be addressing the theoretical foundations of the discipline. And the story didn't say he was a good story teller. But it's different strokes for different folks because other students enjoyed the classes. Have a great new week. Some lecturers are like that. some of them can be unprofessional in their teaching method but that not withstanding does not call for her decision. Moral lesson from the piece: Transfer of aggression is bad., when u are wrong, accept ur wrong and make amend. This is a really nice story. Being angry is a very normal human trait. But no matter what, we should not allow our anger override our rational mind, causing us to hurt the people close to us who only mean well. Very correct. You are lifted, Joy, in Jesus' name. Anger is not bad in itself. There are things we should be angry about and fight against. But we shouldn't let anger control us. That is why the Bible says, "In your anger, do not sin." We're also told not to let the sun go down on our anger. I think that applies more to interpersonal relationships. God bless you! I'm so impressed by the way Juanita resolved to spend her time on Thursdays to help with her anger issues!. At least no one will bore her to death. Lol. It's great that she's found a way to cope in that philosophy class cause going around hurting your friends is a no no for me. I get stressed sometimes especially when my lectures are very tedious so i think i'll borrow a leaf from Juanita and sort myself out. Great story aunty! She's studying Education, Kat! Many years ago, I taught Philosophy of Communication to our diploma students. And about her proposed coping mechanisms, they could get her in trouble if the lecturer catches her. Lol! You are super blessed in Jesus' name. A good story, ma! Knowing what she wants to achieve is success or her drive is success, let her focus be on her performance academically and not on mundane things that won't help her like the boyfriend issues. What boyfriend issues? Perhaps you didn't read the story. Na waa for you oh! Anger trait is one thing everyone has, but we shouldn't allow it to have total control over us just like what happened to Juanita. But I love what she did by planning to do other things to be calm, and no one should be unapologetic. Right. Happy weekend to you! I envy the friendship of both girls, Juanita and Brenda. Brenda the ever chattery and bearable friend who doesn't notice her friend's fury, angry comments and gestures to her. Then Juanita who realises her wrong to her dearest friend and decides to make up... Great friendship! Yeah, they have something worth cherishing. Have a great week! 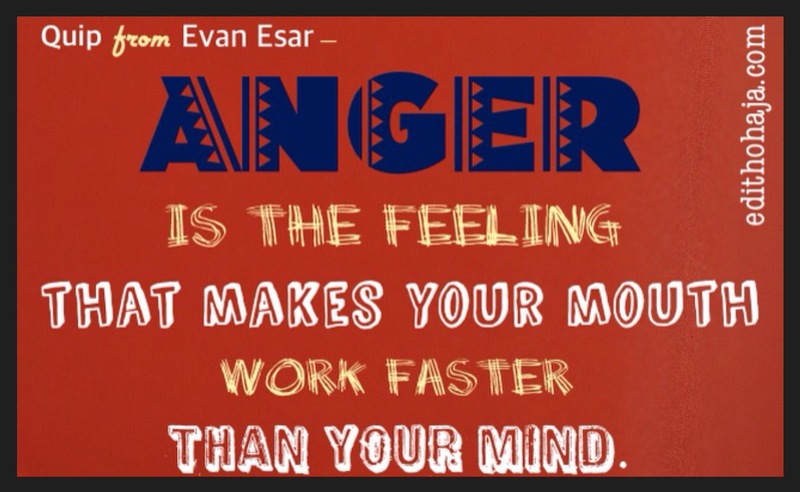 Very interesting piece indeed...the focal point being anger and anger management. Different people have different ways of processing or dealing with difficult situations. But quite frankly, transfer of aggresion will do more harm than good. Not everybody is blessed to have all-weather friends and it's best to keep the ones we have knowing full well that we all have challenges confronting us. Thanks for the piece ma'am. Thank you too, Lawrence. You're awesomely blessed in Jesus' name. True. We will only have ourselves to blame if we do anything that hurts others because we're angry. Some people are in jail today because they killed or injured someone in anger. I pray God's exceeding goodness be your portion always in Jesus' name. Anger is an inevitable thing,one way or another people or situations makes you angry. Whenever I'm angry,I cry it out than to put the anger on someone who doesn't deserve it or at most sleep,I just have to learn to control anger the best way I can and it works for me. Its good as Juanita was able to change her mood and also apologize to her friend. Crying it out? Wow! And it works for you. I never heard of that. I thought anger will make one aggressive, rather than do something passive like crying. You are super blessed in Jesus' name. Anger can destroy many things for us, so how we control it matters a lot. Another important key is understanding. In whatever we do, we should try to understand one another and always have the mind to say sorry to other people as Juanita did to her freind Brenda. You're right. Be richly blessed in Jesus' name. Lol....the unending struggles of university life. She is even lucky to have her rage day on Thursdays only. 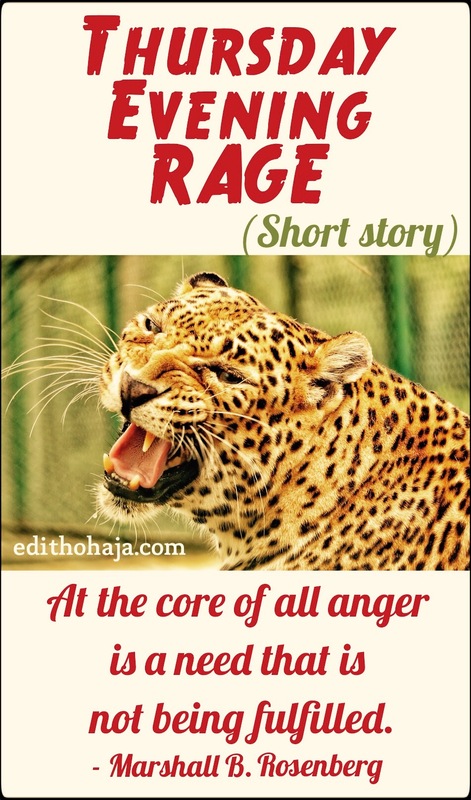 Some students experience rage day everyday!! However,we must look on the bright side and not let stuffs like that get between our friendships. The future is bright. I can't imagine going through that everyday! And you're right, thebright is brightfor those who believe and don't despair. You are lifted in Jesus' name. Thank you Ma for this post. There is a solution to every challenge. I used to face this kind of challenge before but I had to work on myself. Once I'm angry I can say anything to anyone and the bad thing about this is that the person you insulted wont understand, later on you will regret what you have said and if you are feeling too big to apologise, you will lose that friend. 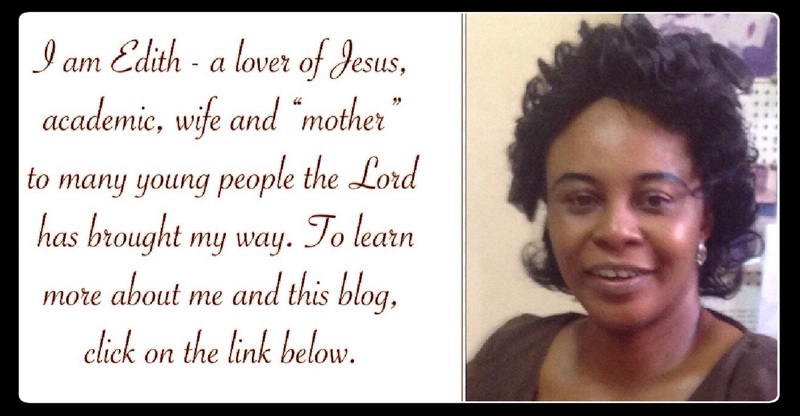 So I had to work on myself just like Juanita did, there is a solution to every challenge. One should never feel too big to apologise. You are the apple of God's eye, forever cherished. Great story, ma! It's not far from the truth. Her solution is good but not totally encouraging because in every nonsense, there is some sense. Who knows, she might pick a point or two from the lecturer's stories! Her transfer of aggression was bad. You're right, it's possible to gain something even when the speaker is rambling but that is if you're in the mood, which she clearly is not. You are favoured in Jesus' name. For me, doing something else when a lecturer is in class is disrespectful, I'm sure the students have something to learn from the lecturer even though he is saying something different from the the course outline. Juanita already knows the kind of person the lecturer is, so she should always brace for it every Thursday and find a way to enjoy what he says. By the way, different strokes for different folks- I can't imagine ironing when I'm angry; the clothes will just turn to burnt offering. Burnt offering, lol! And you make a very good point- no knowledge is wasted. May God decorate your life with wisdom more and more in Jesus' name. Transferring aggression is never enough reason for being angry. I'll advise she do exactly what she feels she can do in order not to be always wearing a long face every Thursday. It is always adviseable to do that which keeps you going, provided it won't or doesn't cause you any harm. Actually it's being angry that results in misplaced aggression as in Juanita's case. You are sooo blessed! I love this story, ma! It's just so relatable, especially in these times when stress levels are high and hitting the roof. Juanita seems a doer, who's not interested in having anyone 'waste' her time on what she considers irrelevances. I appreciate that she's critically analysing the situation which means she will fare better than before. I also learnt recently that we should carry our own climate with us, a positive one though. We can actually decide what our reactions will be when faced with certain unpleasant situations... Greetings, ma'am! I love the part of carrying our own climate around and not letting negative situations to overwhelm us. God bless you abundantly in Jesus' name. Honestly, I think a lecturer not handling his course well is not enough reason to be that angry. And to transfer the anger to someone else? That's low. I think she has an issue with control. She wants things all going the way she wants without any interruptions. That must be her frustration with the lecturer, hence, every Thursday rage. Her alternative plans are good o, but she better pray the lecturer does not discover her tricks one day. It won't be funny at all. Lolz. In as much as we are humans, we are bount to get annoyed most atimes which is normal but we should learn how to deal with this anger when it surfaces so as not to do things we would regret and to deal with this problem the grace of God is required. I think its best for her not to attend the class if she feels that offended. Getting a material or the speculated textbook would be better and probably read on her own. Allocating other things with that time is not a bad thing too. Although anger should be dealt with no matter the cause. 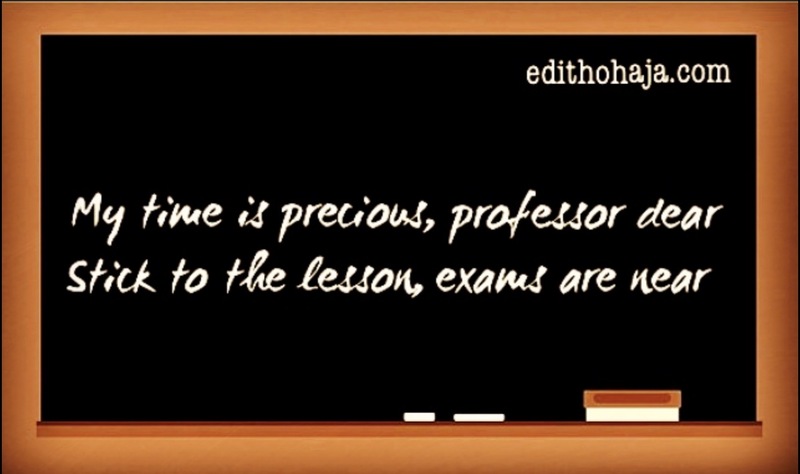 The lecturer gives unscheduled tests, remember? Bless you! I understand Brenda's plight perfectly. I've been in her shoes so I know how it feels. This story reminds me of Mrs Udeoba our broadcasting lecturer in a certain polytechnic. We nicknamed her 'Nkechi' because she always tell us stories about Nkechi who happened to be their Nanny. She's very good at telling boring stories that don't correlate with the course she's handling. Most times, students laugh at her 'iberiberism' not as if her stories were funny. And when exam comes, you won't even see 'Nke' talk more of 'Chi' in her questions. Despite how annoying Mrs Udeoba was, I try not to be frustrated because frustration often leads to agresion. It all boils down to how we manage our anger, we should endeavor to control our anger and not the other way round. In addendum, I admire Brenda's resolution and wish we all find solution to our problems. Thanks for sharing this piece Ma. Anger is normal for every human being. But I think the way with which its being handled makes every human unequal. She got angry yes! But I like the fact that she talked to herself to find a way out of always being angry every Thursday evening. If she sticks to her plan, she won't miss out on any impromptu test, she won't miss out from writing her name down on the attendance sheet and most importantly, she gets to do other things of high priority to her. So, I think it is a lesson for us to learn to manage our anger. There are always solutions to every problem. Not only does anger make you feel bad, it makes you do stupid things without noticing the risks and it can be self-destructive. One thing I will like to tell Juanita is that she shouldn't let anger control her emotions to the extent that she insulted her friend and also left her with no other option than to make her hate the lecturer and what he is teaching. Funny enough that she could get a solution for her Thursdays and she hurt her friend's feelings. Well anger can be one big disaster. I think no matter how angry we are, we should never transfer our aggression to others. Because they could actually be of help to us and we shouldn't always think our situation's the worst meanwhile they are other people with worse days than ours but they take it mature than we do. We should always deal with our anger before we do something rash, and lose our friends. I must confess this story touched me , this is a typical example of what we are passing through now... working from Mass communication department to Abuja building...for two hours lecture, sometimes before we get there the whole place has been filled up because there are five department offering the course...most times the lectures will not hold..and if it holds we won't be able to hear the lecturer...but getting angry will not solve the problem... sometimes I will tell myself that am not the first to experience such a thing and I am obligated to do whatever the person in charge of the course ask me to do... anger in this situation doesn't help at all, rather it would add to the problem. Anger is something that can be controlled no matter what makes you to be angry. People should try and look for something that will make them happy in every situation and thank God Juanita found what will make her happy and avoid being angry every Thursday evening. Words spoken in anger are often regretted. Weigh your words carefully before you speak. #quote . This quote got to me. Thank you for the amazing write up ma. Believe me, this is just like walking from faculty of arts to Abuja building every Monday under the hot sun, lool. But this are just one of the things we face in life, everthing mustn't work out the way we want, and when this happens instead of grumbling over it, we should learn to work it out. Mind over matter. Anger distorts our daily activities and scrambles our thinking about everything. Some lecturers are not favourable but we have to device a means to get by everyday or else, it won't be funny. Nice piece! Wow nice story! Anger is an indispensable trait in human beings, but controlling it is what make us rational beings. I'm impressed by the way Juanita controlled her anger, it shows maturity. But transferring aggression to the other is unwise, she needs to work on that if she don't want to lose her friends. Sometimes lectures say some certain things outside their course out, because they think it's vital for us to know. No lecture is a waste and we shouldn't hate our lecturers because it may affect our performance in that course. Apt.This is a case of transfered aggression, I think. Anger management is a skill one need to learn so as to avoid awkward situations as this. I love the idea of how she(Juanita)devised a means to manage her Thursday evening rage and make up with her friend. 'Verisimilitude'- a high sounding word every writer that wants to be taken seriously should not joke with. Going through the story, it's hard to imagine this is fiction. I can only empathize with Brenda the more because I had to go through lecturers like that as an undergraduate. I hope this is not the end? I want to know if her 'thursday strategy' worked out and if she apologized to Juanita. Thanks Aunt Edith for sharing. True, Jerry. The closer to reality our story looks, the better it will be received. This is the end, my dear. I'm glad you found the story engaging. Keep making us proud out there and be richly blessed in Jesus' name. To be frank, some lectures are not funny at all. To make it worse, if it's a very large class, one may end up not learning anything which is so annoying and in this case transfer of aggression can only be avoided by God's grace. One thing I learnt is to keep calm whenever I'm angry because anger can make one spit what helshe will ever regret throughout his or her life. It's better it does not happen cos to forgive may be easy but to forget, that's one of the hardest things to humans. I like the way you were able to capture how different people react to extra-curricular talks. Some people are so uptight and parochial that they don't even want to see life other than they know it. And at the end of the day, they would go out to the Labour market and still have issues coping with ad-hoc assignments and individual quirks. Glad to hear from you, Chinny! It's good to be versed in many things but it can get out of hand and students worry when the content of lectures vastly differ from what will be expected from them in exams. Abundant blessings on you and your family in Jesus' name. Great post, ma! Lolz! Brenda's transfer of agression was terrible. Students complain because you can't miss a lecture, still the lecture is not giving what you are expecting. Her solution to the problem at hand was good but Brenda should also know that in every nonsense there must be some sense. At least, she should listen sometimes. God bless you, ma! What a smart way to get through unfavourable situations. when we are not able to control what happens around us and what gets into us, all we need do is devise other survival tactics to deal with them. Juanita's decision to avoid getting angry on thursdays is just like a bullet-proof or an antibody that will make her immune to the thursday sickness. at least it's far better than taking drastic decisions and having issues with the lecturer and every other person around. and its a good thing she later apologised to her friend. I know of a lecturer who does this, it's not funny at all. Some lecturers should learn to be considerate in fixing lectures. For the fact that sometimes man expresses his animalistic nature of being aggressive, and at same time passing it to others around him. He needs the grace of God to sustain him. So, I think the action Juanita is about to carryout is a nice decision... Doing other things that will make her happy in the same thing that had irritated her. Am going to agree 💯 with Juanita that getting angry is not good and applaud her for thinking up a means to not let anyone or anything put her in a bad mood. Beautiful piece ma'am though fictious but 60% of students can relate to this. I found this story really relatable because I can be quick to anger and say hurtful things that I regret later. I have gradually learnt not to dwell in my anger and give it more fire. Letting go of that hurt and reason that made me angry has worked best for me. JUANITA also transferred her anger and frustration on poor Brenda, really not nice. I just love the way she resolved to tackle the issue causing the rage on Thursday evening. It’s better that way than ruining your happiness and hurting your loved ones. I always believed that even in a fool's talk there is an atom of wisdom and truth you can learn from. Juanita isn't meant to take it up to that point of being sad over the issue and transferring aggressions on her friend. Come to think of it the cause of her annoyance isn't even aware that his student isn't copying with his style of teaching. This are just everyday things student face with some of their lecture. As rational beings,we ought to learn how to control our emotions.Transfer of aggression is one bad habit which everybody is supposed to avoid.She ranged at her roommate and friend just because of what happened in her class. I have just learn how to accommodate all situations at every point in time. Thank you mar for the wonderful write up. Lesson learnt.....making a decisions on some academic problems on how best to handle them also how am to control my speech even when am angry. Lesson learnt. Making a decision on some academic problems on how best to handle them also how am to control my speech even when am angry. This is soo me! I listen to songs when I am angry, it helps in calming me down.I love her plans of handling the lecturer's classes, it's definitely something to pickup. We should try not to let things that are a usual occurrence annoy us. Instead, we should get used to it and learn to adjust to it in a way that would stop our anger. Just like Juanita, we can find something that takes the anger away. Wonderful story. Thank you so very much ma. A lot of people need to learn that anger isn't always the best and The worst thing you could do to a friend is transfer aggression when ever you are angry. Juanita and Brenda are best friends and they are inseparable, but anger brought asunder, though there was a final resolution, the means deviced by Juanita is questionable. Not being able to put our anger under control is very bad because it could cause problems with our relationships, like it almost did with juanita and brenda. Just imagine if she kept transferring her anger to everyone she was close to, they would all start avoiding her. It's a good thing juanita realised that her anger was spiralling out of control and she found a means to curb it. It is human to be angry. Anger is a natural human emotion and not a bad one. Nevertheless, scriptural it is written, “Do not let the sun go down while you are still angry (Ephesians 4:26).” This means you can be angry but do not let your anger control you. Juanita gave in to anger and it obstructed the flow of her relationship with her friend. On this note, Say No Anger! Some lecturers are like that. Some of them can be unprofessional in their teaching method but that not withstanding does not call for her decision.Moral lesson:We should do away with the attitude of transferring aggression as seen in the case of Juanda to Brenda. Transfer of aggression can cause and cost us a lot. I like that she figured out what to do while the lecturer wastes time but I don't like that her friends couldn't understand and try to console her, than succumb to her anger. When some certain things become inevitable in our lives, all we need to do is to learn how to accommodate it and suppress it with every reasonable measures. Anger is one of those things, but what makes someone a mature person is the ability to control his emotions no matter how bad he feels. Juanita might have chosen to pay no attention to what her lecturer is saying but that is not the perfect way to overcome such situation. Remember, in every nonsense, there must be atom of sense. It is just the "non" that disqualifies it from being sense. What am trying to say is that she should learn how to accept some things that doesn't interests her. Even when you don't like it, just pretend that you like and be part of it. By doing that, you're not just easing your anger but at the same time, you're also helping yourself by learning how to adapt with critical moment. The best way to solve a problem is to always stay with the problem. The more you stay with it, the more familiar it becomes to you and the more you learn how to solve it. Juanita's curb measures over her problem is like a man that got himself intoxicated over a particular problem ; once the tides are over, the problem approaches with full speed. He didn't solve the problem, he just ran away from the problem. Another wonderful one ma, I believe u wrote the mind of some of us and how we feel about some of our lecturer's. they come to tell us stories that doesn't concern their course and get everyone bored but they make sure you don't miss classes by taking attendance. This is how poor the system of education is in our society. Haha!! Funny but I learned too. Let's not let anger determine our actions or the words we speak. There's also a saying which goes: "Don't let temporary emotions make permanent decisions". I get mad when people fail to do what they are meant to do per time, especially when they know it. Sometimes, since I know that he (/she) should be aware of their wrong, I don't let him know my anger, so I just bottle it up and let it pass. Some times still, I do. It just depends on what I feel is more important at such time. Well, I feel same way as Juanita, when some "all knowing" lecturers come to the class only to waste the time on talking about themselves... I just feel like walking out of the class at such time but it's seems to be impossible cos you can't predict such people. Great piece Ma. It’s really annoying to have your time wasted. I understand Juanita. However, I blame her for not thinking before acting; for allowing her emotions get the best of her. I’d advice Juanita to take a cold drink and a nap after her Thursday evening class. When I get really angry, I try not to say a word because I may end up annoying my listener. It’s well though. Aha! I can relate. Sometimes I just decide to miss the class to help retain my sanity, but just as Juanita it's best to device reasonable means to go by it. Thank you ma for this. Glad to know you know how we feel. Anger is something that everyone feels, but who do we control our anger to avoid making another persons day a night mare. For Juanita she have to prepare her mind for Thursday lecture.